What is the Four Lakes Cruise? 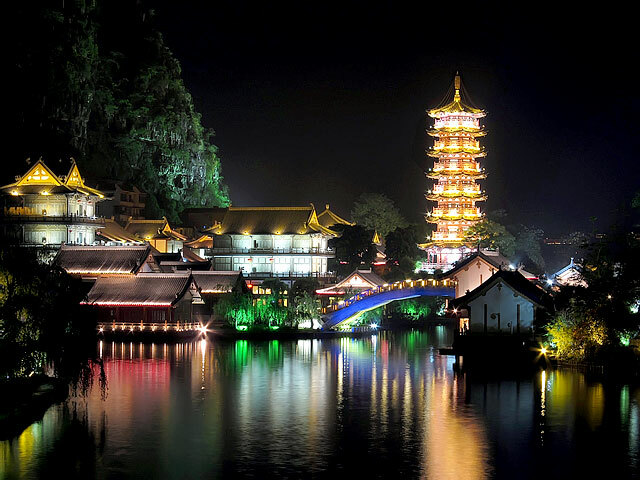 Four Lakes Night Cruise offers a great chance to admire the amazing night views of Guilin City. The four lakes refer to Wooden Dragon Lake, Guihu Lake, Ronghu Lake and Shanhu Lake. The scenic area was originally set up in the North Song Dynasty (960 - 1127). At that time, these lakes were popular among tourists. They enjoyed the natural beauty on a boat. Old evergreen trees guard the lakes and witness the development of Guilin. Four Lakes Night Cruise will take you to appreciate the natural beauty with the cultural spots, such as the Sun and Moon Pagodas of which the Sun Pagoda is the tallest bronze in the world, old banyan trees which are more than 800 years old, the glass bridge spanning over Ronghu Lake, reliefs and much more. With a height of 41 meters, the Sun Pagoda is the tallest bronze pagoda in the world. At Guihu Lake, you will find the ruins of the city moat originally built in the Song Dynasty (960 - 1279). It lies 1,700 meters from the south to the north. The average thickness is around 100 meters. Banyan trees, ginkgo trees, cedars, dawn redwoods, lily magnolia and the like stands by the lake. In addition, you can admire the authentic cormorant fishing demonstration at Guihu Lake. Around ten fishermen with more than twenty cormorants show the old culture on ten bamboo rafts. Local actors present classical Chinese music show and stunning dancing at some spots at the four lakes area. When the cruise boat passes under a bridge, you will be amazed at the reliefs carved on the surface of the bridge. The Chinese-style building on the island in the middle of the Ronghu Lake is also a highlight of the Four Lakes Night Cruise. Trees along the lakeshore in the colorful light make for attractive views as well. The opening time for Four Lakes Night Cruise is from 19:10 to 21:15. The best months to enjoy the Four Lakes Night Cruise are from April to October. Passengers are required to board the cruise boat at the Sun and Moon Bay Pier (日月湾码头). The pier is located 50 meters in front of the Guilin Ljiang Waterfall Hotel. There is no direct bus to the pier. Thus, the only option is to rent a vehicle. As at 7th March 2019, the cruise boat starts at 19:30, 20:40 and 21:50. As at 7th March 2019, the entrance pricing to the cruise is 175 CNY per person; the children between 1.2m tall (1.2m tall included) and 1.4m tall (1.4m tall not included) are charged 88 CNY per person; children under 1.2m tall (1.2m tall not included) are free of charge. For the latest pricing information, please contact us via email (info@wendyweitours.com). Please take care of your children. Please take care of your camera and cellphone when you take pictures on board. Interested in visiting Four Lakes Night Cruise on a Tour? Wendy Wei Tours offers a variety of different packaged tours as well as custom tours including Four Lakes Night Cruise, among other attractions and destinations. To find out more, please visit our Tours page or Contact Us directly to find out more.